Recently I got a rose plant from one of my friends who got married. I have been having plants of all sorts at my home but as any busy guy I forget to water the plants. This is a problem I thought I need to address using technology. After doing some research I got to know about a Platform called ThingsBoard which allows Devices to connect to a central server using HTTP, MQTT, CoAP protocols and send telemetry to visualize everything in a Dashboard. I quickly downloaded it, used my Ethernet Shield, DHT11 sensor and YL-69 Soil Moisture sensor which I had lying around to check the possibility of integrating everything together. I just connected YL-69 Soil Moisture sensor to Arduno Analog Pin A1 to read the sensor data and Digital Pin 7 to power it if and when required. I connected Digital Pin 6 to read the sensor data from DHT11 sensor. Finally I followed the ThingsBoard Installation guide  and Getting Started guide  to setup ThingsBoard server in my laptop. Finally wrote the following Arduino Sketch to use Ethernet Shield to connect to the network and ThingsBoard via MQTT protocol to send data. Data was sent in following format. You can see a Demo below where the Blue Color Soil Moisture sensor reading go up and down based on inserting and removal of the YL-69 sensor probe and Temperature and Humidity going up when I exhale hot air into the DHT11 sensor. 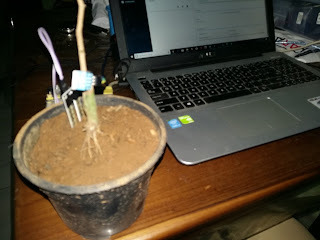 Future work would be to add ESP8266 wireless connectivity to the entire thing and using ThingsBoard rule to fire and send an email when soil moisture level goes down below a threshold.